Poplar Island is a minor waterways place minor waterways place place on the waterways major waterways place village town city on the River Thames (below Oxford) between Pangbourne (4 miles and 1½ furlongs and 2 locks to the west) and Thames - Kennet Junction (Kennet Mouth) (Junction of River Thames with the River Kennet at Reading) (3 miles and 5½ furlongs and 1 lock to the east). The nearest place in the direction of Pangbourne is Tilehurst Station; 3 furlongs away. 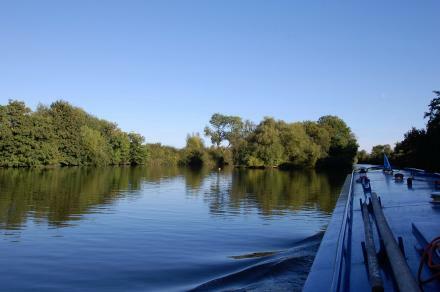 The nearest place in the direction of Thames - Kennet Junction (Kennet Mouth) is Appletree Eyot; 1 furlong away. Oxford Industrial Estate, Gresham Way, Reading, RG30 6AW — 231 yards to the south. 121 Loverock Road, Reading, RG30 1DZ — 1472 yards to the southeast. Bowman House, 210 Bridge Street, Reading, RG1 2LU — 1550 yards to the southeast. Aldermaston — 1380 yards to the southwest. Stadium Way. (Scours Lane End), Tilehurst, RG30 6BX — 1006 yards to the southeast. Tilehurst, Reading — 1475 yards to the southwest. 60 Loverock Road, Reading, RG30 1DZ — 1402 yards to the southeast. Field & Hawken Ltd, Reading, RG30 6AW — 180 yards to the south. Victoria Rd, Reading, RG31 6AA — 1360 yards to the southwest. Reading — 1189 yards to the southwest. Crescent road, Tilehurst, RG31 5AH — 1625 yards to the southwest. London — 1587 yards to the west. Oxford Rd, Reading, RG31 6 — 627 yards to the northwest. Reading — 1280 yards to the southeast. Reading — 1475 yards to the southwest. Tilehurst — 1475 yards to the southwest. Reading — 1404 yards to the southeast. 123 Loverock Road, Reading, RG30 1DZ — 1459 yards to the southeast. rodway road tilehurst reading, Reading, RG30 1 — 1073 yards to the southeast. Bodycoats Road, Chandler's Ford, SO53 2JD — 981 yards to the southwest. Armour road, Tilehurst, 316 — 1483 yards to the southwest. Reading — 1410 yards to the southwest. Iona Avenue, Reading, RG30 — 1470 yards to the south. 4-6 School Rd Tilehurst, Reading — 1458 yards to the southwest. Deacon Way, Scours Lane, Reading, RG30 6AZ — 662 yards to the southeast. 994 yards to the south. Reading, WWW.CLEARVIEWBUILD.CO.UK — 1475 yards to the southwest. 98 Grovelands Road, Reading, RG30 2PD — 1631 yards to the southeast. Reading, RG30 1EH — 1612 yards to the southeast. Unit 7, Sterling Way, Norcot Industrial Estate, Reading, RG30 6HW — 1048 yards to the southeast. Armour Hill, Tilehurst, Reading, RG31 6LE — 1056 yards to the west. Reading Retail Park, Oxford Road, Reading, RG30 1PR — 1205 yards to the southeast. Unit 4 Gresham Way, Reading, RG30 6AW — 191 yards to the south. 1502 yards to the north.